Now in full color, this best-selling text will introduce you to the basics of infectious disease epidemiology, environmental epidemiology, molecular epidemiology, and psychosocial/behavioral epidemiology. 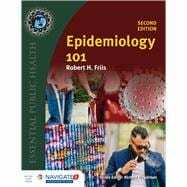 Perfect for those with no prior familiarity with health-related fields or statistics, Epidemiology 101, Second Edition, uses a clear, cohesive writing style and follows the basic Epidemiology 101 curriculum framework as outlined in the AAC&U and APTR Recommendations for Undergraduate Public Health Education. End-of-chapter exercises provide access to a laboratory component for college science courses that require a laboratory.